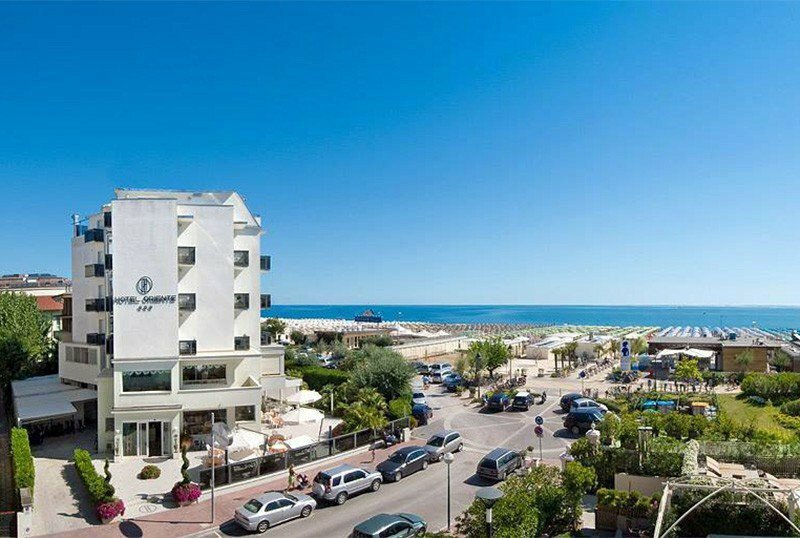 Hotel Oriente is a 3 star hotel in Milano Marittima located on the beach front and recently renovated. It offers panoramic views and features a furnished garden terrace and free WI-FI access throughout the property. Pets Allowed. The hotel is located in Milano Marittima directly on the beach, to which it has direct access. Less than 10 minutes walk will take you to the town center. The rooms, recently renovated, have a panoramic balcony, air conditioning, orthopedic beds, satellite TV, direct dial telephone, minibar, safe, WI-FI connection, bathrooms with shower and hairdryer, courtesy set. Most rooms overlook the sea. FAMILY: multi-bed rooms are available. Terrace-garden accessible from the hall, free use of bicycles, elevator, bar area, newspapers available. Theme nights are organized. PARKING: covered and paid, available subject to availability. PETS: all sizes accepted with payment of a supplement. BREAKFAST : served buffet style in the garden terrace, with sweet and savory products. LUNCH AND DINNER: meals are served in the panoramic restaurant, with a buffet of vegetables and appetizers and 3 menus to choose with recipes of Mediterranean cuisine and the Emilia-Romagna gastronomic tradition. With the "drink formula" water and wine with meals are included. OTHER: every week we organize typical rustic dinners and theme nights in the garden with piano bar and tastings of flambé specialties. In the hotel: baby-sitter and pediatrician service on request and for a fee. At meals: baby food and high chairs at the table. The hotel has an agreement with the bathing establishments: Bagno Umberto, Bagno Attilio and Bagno Giorgio Malusi. Bagno Umberto has a playground area for children, a restaurant area and sports fields. Bagno Attilio offers a playground area for children, disabled facilities, sports fields and Wi-Fi. While, the Bagno Giorgio Malusi is surrounded by gardens with waterfalls and relaxation areas, sports equipment, children's playground area, free WI-FI. Price list per day per person in full board (VAT included), applied for a minimum stay of 3 days. TOURIST TAX: not included. € 1.00 (April-May-September), € 1.50 (June-July-August) per person per day for a maximum of 7 consecutive nights. Excluded children up to 14 years. - from 15 years: -20%. May and September special conditions and gratuity. - Reservations are considered valid upon payment of a deposit. - In case of delayed arrival or early departure with respect to the booked dates, the Management is required to request compensation that is due to it. - Full board is recorded from lunch on the day of arrival to breakfast on the day of departure. - For stays of less than 3 days the list prices of the services (room and meals) are applied. The offer is valid for a limited number of rooms for a minimum stay of 2 nights. Minimum stay of 2 nights from Monday to Thursday, room with balcony facing the sea. -free wi-fi in the room and in the common areas. - access to the Dolce Vita Wellness Center, at the "Palace hotel 5 *" adjacent to us.